Inserting Your Pathetic Foot Twice? Ms. Palin, when will you ever learn? Press Secretary Robert Gibbs called you out about getting your facts straight and so what do you do? You call him out and you STILL Don’t Know WTF you are talking about! 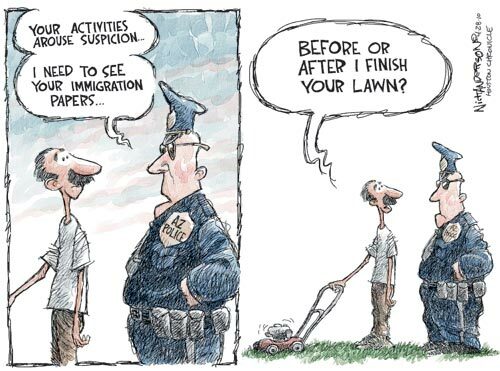 You had better start checking your facts with independent sources before your shoot your pathetic mouth off. Here are some facts for you Ms. Palin as here are the REAL Numbers for the amount of money that has been contributed by Major Domestic and Multinational Oil and Gas Producers and Petroleum Refiners. 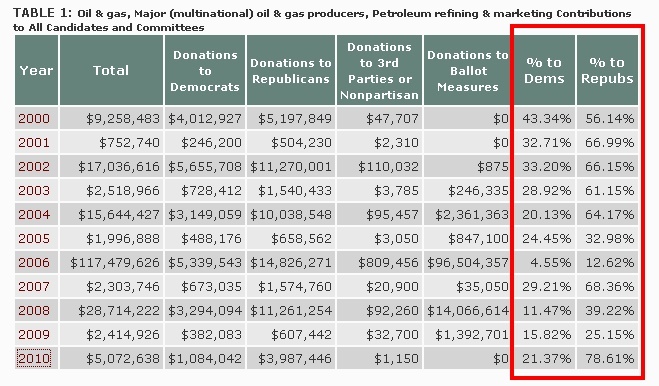 EVERY YEAR from 2000 through 2010 Republican Politicians have been the major recipients of lobby money from Major Oil Producers. 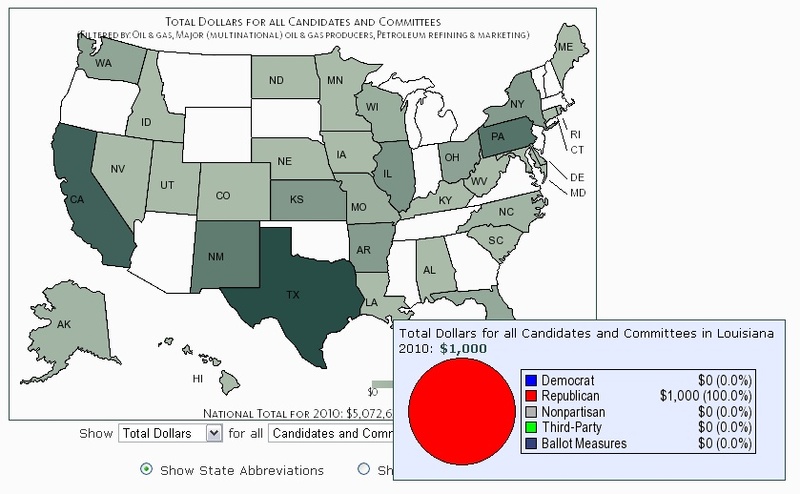 In 2010 thus far the Republican Politicians have received a whopping 78+ Percent of the lobby money compared to 21 Percent for the Democrats! 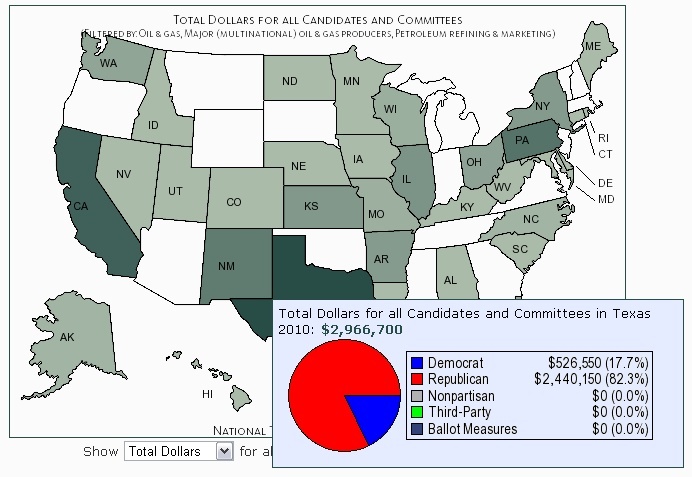 Texas Republicans received 82.3 Percent of the Money from Big Oil! 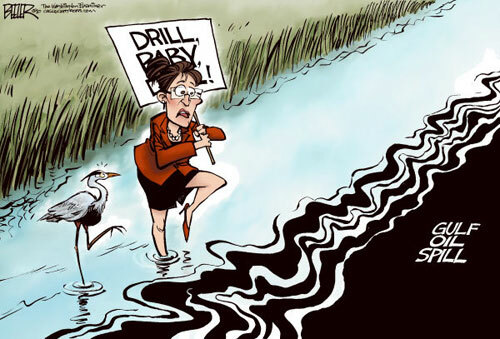 Louisiana Republicans Received 100 Percent of the Money from Big Oil! 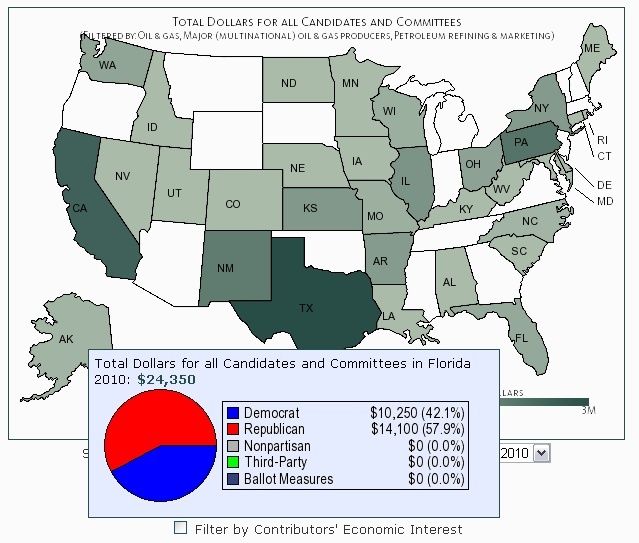 Florida Republicans received 57.9 Percent of the Money from Big Oil! 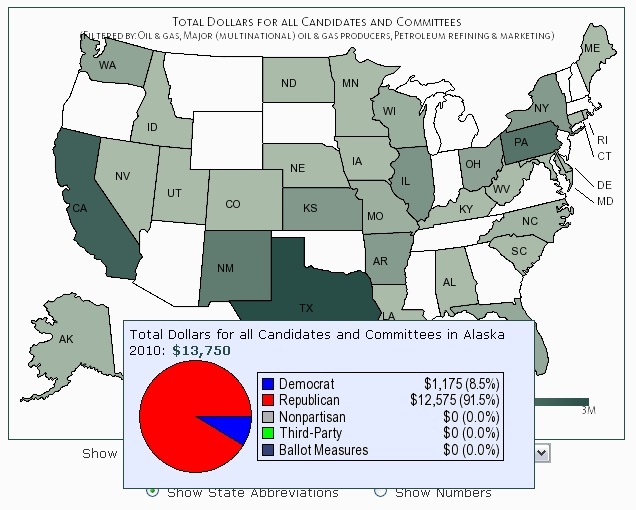 And No Surprise… Alaska Republicans received 91.5 Percent of the Money from Big Oil! Ms Palin, Care to Revise Your Pathetic Statements and Facebook Fairy Tail Lies? You know the great thing about all of this is You are in a continual self destruction spiral and to be honest, I just laugh when you make such pathetic and unsubstantiated lies that YOU CAN NEVER Back Up! You are nothing but a Stupid Retard who has Diarrhea of the Mouth and you don’t know how to stop. What do you have a mouse in your fricking pocket Ms. Palin? Last time I checked I wasn’t now or have ever been from Arizona. Then we have Ms. Brewer with: “The president apparently considers it a wonderful opportunity to divide people along racial lines for his personal political convenience.” Are You Serious Mr. Brewer? 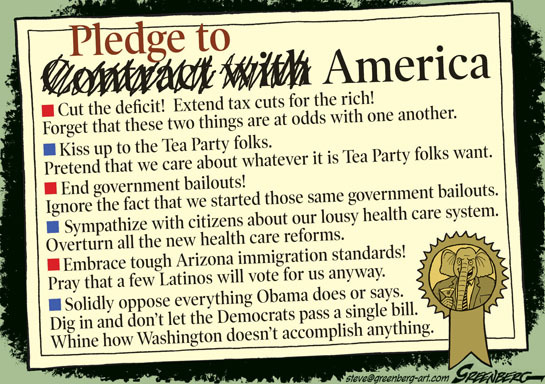 Have you been taking lessons from that Dolt Palin? Every time you stupid Republicans align with this moron your credibility goes in the toilet and it definitely got flushed with that pathetic, brainless twit by your side. I mean seriously Ms. Brewer, It’s obvious that after watching your videos that you seem to be an intelligent woman. If that were truly the case, then why would you want such a stupid and asinine woman support your cause? 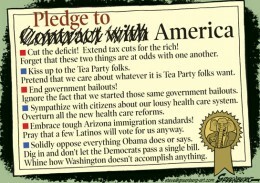 Do you really think the extreme right that Palin represents is good for your cause? I guess if Ms. Palin has purchased Old El Paso Taco Fixings and beans that gives her the credibility to discuss immigration in the state of Arizona. Yeah, okay, I can see your logical connection there. Dear Ms Brewer, Since you had a complete brain lapse in having that Dolt Palin be your Talking Points Bonehead, you can forget support from any of us, especially considering your new immigration laws violate the US Bill of Rights! PS You must be taking your lessons from that washed up, pathetic old prick McCain. Dear John McCain, You are going to go down in history as the stupidest MF’er that ever entered into politics for unleashing this viral cancer called Palin on this country. You Sir are a worthless piece of trash.